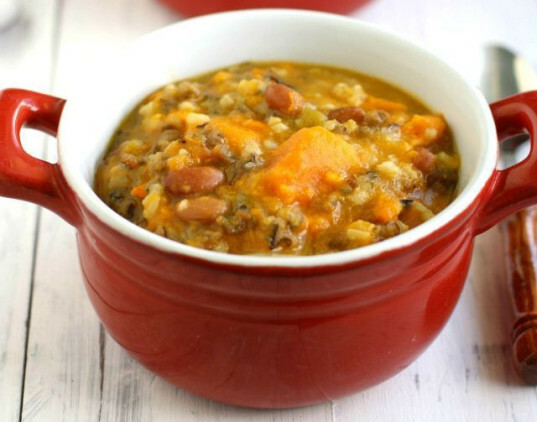 Provided a peanut allergy isn’t an issue, this sumptuous and hearty soup from Kalyn’s Kitchen has all the makings of a family favorite. The recipe does call for a fair slug of chile, so adjust quantities as necessary for little ones. Some kids love broccoli, some kids hate it. 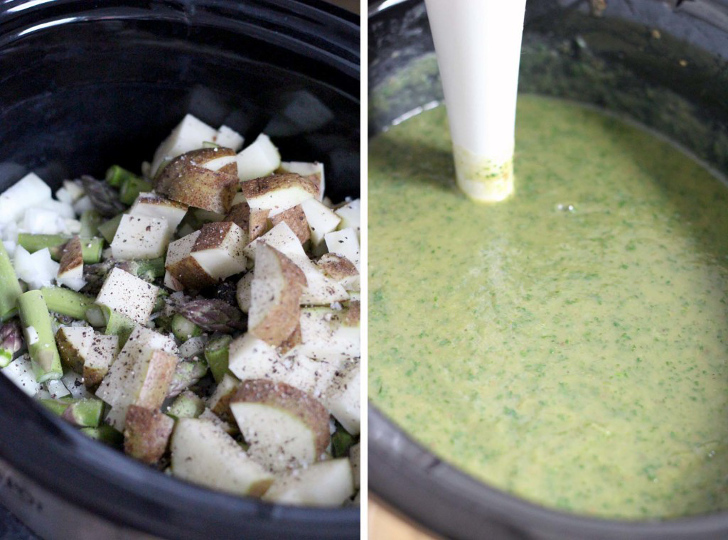 And while the haters gonna hate, you can disguise this marvelous vegetable in Veggie Primer‘s cream of broccoli soup. This recipe also includes a delicious sesame-enriched seasoning that can be added to anything else that takes your fancy. 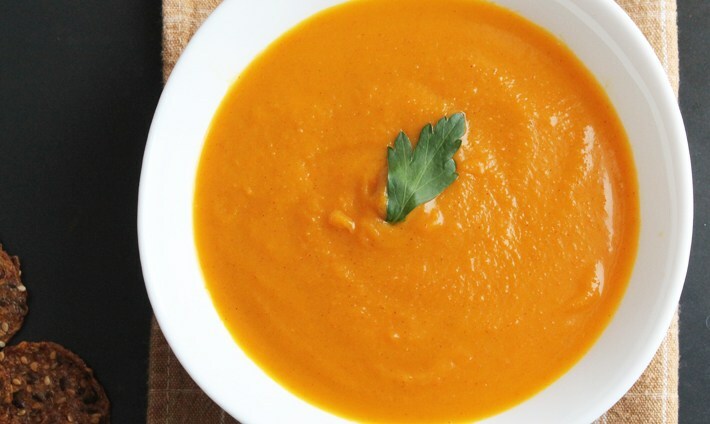 A bit of a twist on the big vitamin A hit that is pumpkin soup, the addition of sweet potato, carrot and maple syrup lightens this dish from Delightful Adventures and should make it a winner with those who like their flavors on the sweeter side. With its bright, family-friendly flavors, this tomato and basil slow cooker soup from Running in a Skirt will transport you back to the balmy days of summer in a flash. The recipe calls for a garnish of Parmesan cheese, but either omit this, or substitute with a vegan cheese if desired. The warming southwestern flavors of this soup, from Making Thyme for Health, will keep the cold at bay. As an added bonus it’s loaded with protein and fiber, and the tortilla strips and other garnishes make it fun for kids too. 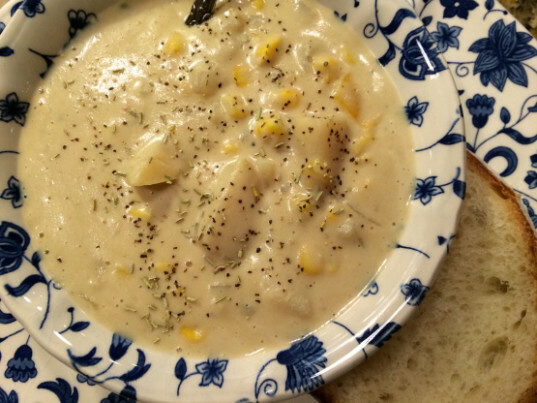 Lighter than the usual creamy corn chowder, this version from Oh My Veggies will still warm you to your toes on a frosty day. 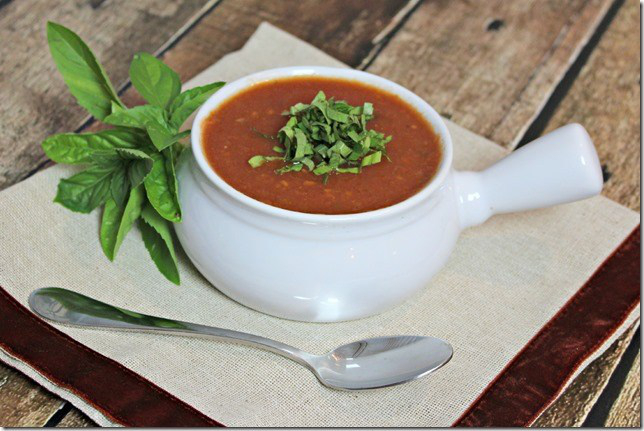 The recipe adds red peppers for zip and the soup gets its depth from soy or almond milk. 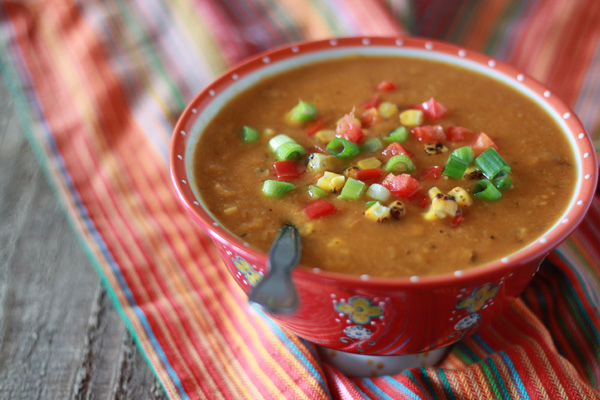 If you like your soups chunky, then this recipe from The Pretty Bee is a must-try. It features tasty morsels of veggies, plus pinto beans, brown rice and the wonderful, toothsome texture of wild rice. The epitome of comfort food after a long, cold day! Here’s a tasty slow cooker soup that gets its magic from finishing touches of fresh baby spinach, dill and lemon juice. Bowl of Delicious recommends garnishing with croutons plus an optional poached egg for non-vegans, but it will hold its own very nicely without the egg too. Pasta e fagioli (pasta and beans) is a hearty, Italian, peasant-style soup. The ubiquitous Olive Garden version of the soup found online incorporates ground beef, but at its cucina povera roots this dish was usually made with minimal or no meat because it was too expensive. This recipe from Kitchen Treaty has variations to cover all food-choice bases. This soup from Happy Healthy Mama is rich and creamy thanks to the coconut and is packed with protein. Making sure you use a mild curry mix will keep it child friendly. 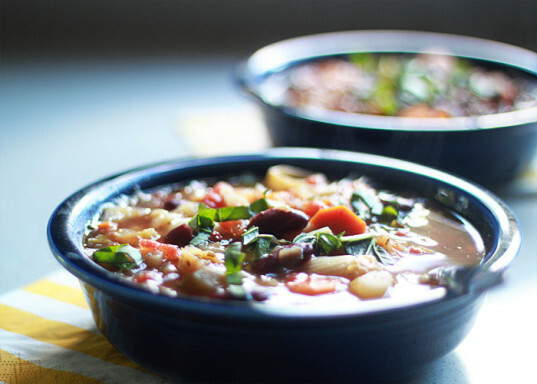 Minestrone really lends itself to the slow cooker method, as all the flavors have time to meld together into something deliciously greater than the sum of its parts. This recipe from Two Peas and Their Pod is crammed with vegetables, beans and wholegrain pasta. 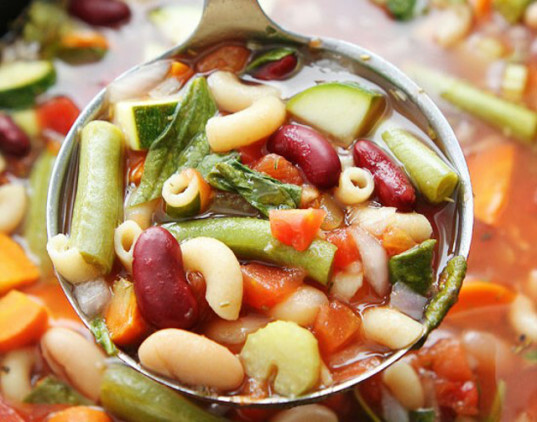 An added bonus with minestrone is you can feel free to swap and substitute vegetables if there are particular favorites or no-go zones in your household. We’ve featured this recipe before, but it’s worthy of an honorable mention here again because it’s a slow cooker masterpiece. Sunrabbit’s corn chowder is delightfully thick and rich, being full of almond milk, garbanzos, cashews and nutritional yeast. The creaminess and the corn are sure to make it a crowd pleaser. Some yummy-sounding soups in this bunch; thanks for including me! When the cold weather strikes, there's little else like a comforting bowl of hot and hearty soup to warm the bones and the soul. 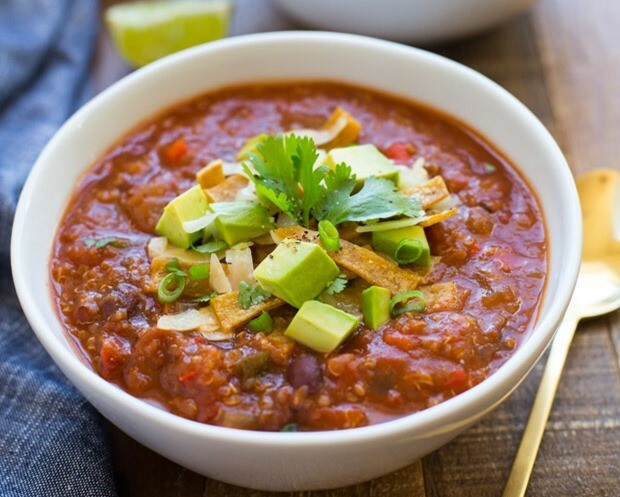 Below we've gathered 12 recipes for nutritious and delicious vegan soups, all created for the slow cooker to save valuable time and make your home smell amazing! Whether your family likes their soup chunky, creamy, spicy or fresh flavored, there's sure to be a new household favorite below to tide you over the long winter months. Enjoy! 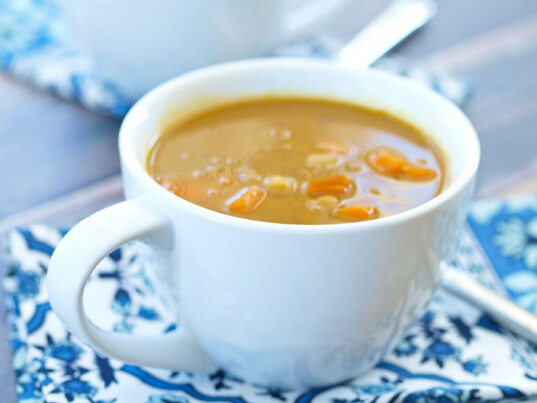 Provided a peanut allergy isn't an issue, this sumptuous and hearty soup from Kalyn's Kitchen has all the makings of a family favorite. The recipe does call for a fair slug of chile, so adjust quantities as necessary for little ones. Some kids love broccoli, some kids hate it. And while the haters gonna hate, you can disguise this marvelous vegetable in Veggie Primer's cream of broccoli soup. This recipe also includes a delicious sesame-enriched seasoning that can be added to anything else that takes your fancy. 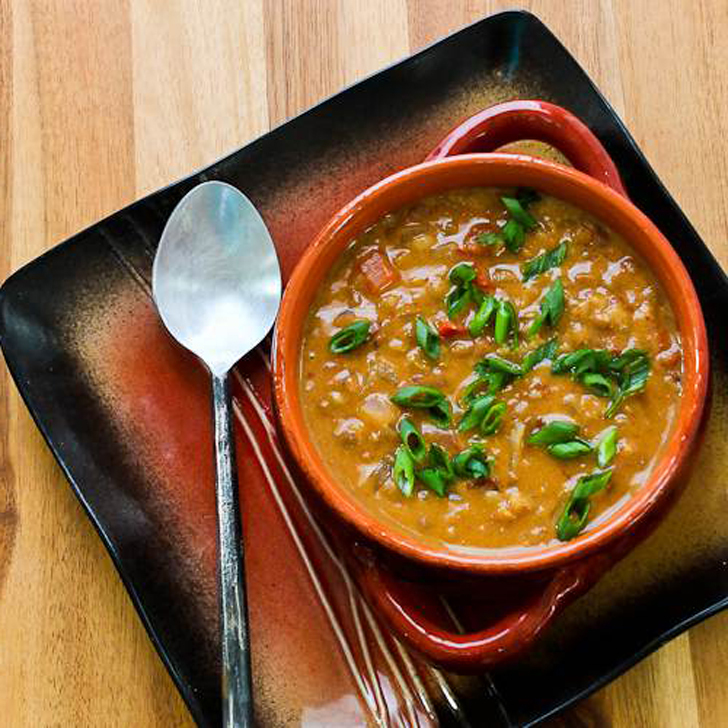 The warming southwestern flavors of this soup, from Making Thyme for Health, will keep the cold at bay. As an added bonus it's loaded with protein and fiber, and the tortilla strips and other garnishes make it fun for kids too. 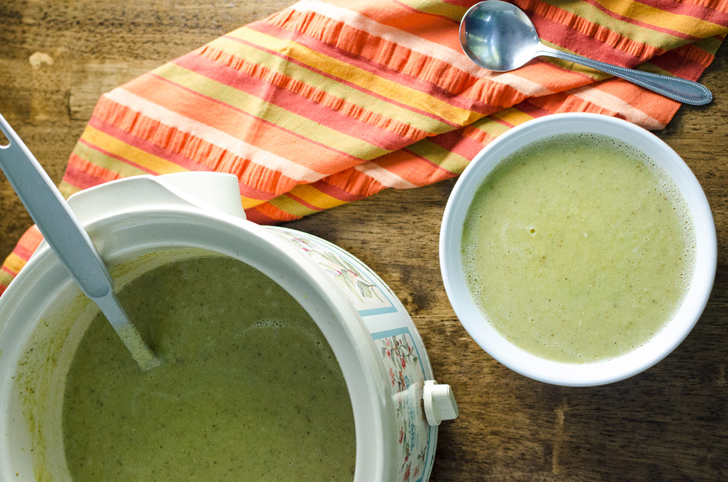 Here's a tasty slow cooker soup that gets its magic from finishing touches of fresh baby spinach, dill and lemon juice. Bowl of Delicious recommends garnishing with croutons plus an optional poached egg for non-vegans, but it will hold its own very nicely without the egg too. We've featured this recipe before, but it's worthy of an honorable mention here again because it's a slow cooker masterpiece. Sunrabbit's corn chowder is delightfully thick and rich, being full of almond milk, garbanzos, cashews and nutritional yeast. The creaminess and the corn are sure to make it a crowd pleaser.